How often have you heard someone say, “A picture is worth a thousand words?” If that’s true—and we here at AXP believe it so—then the stories told by Aramco annuitant Bert Seal, Badge Number 17347, with his camera while serving as a photographer with the Public Relations Department in Dhahran from 1955 to 1960 are surely worth millions of words. 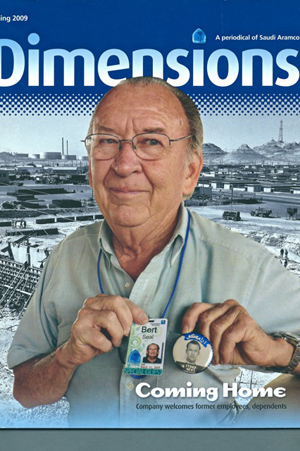 Recently, Bert shared some of the special memories he carries with him today from those critical years in the company’s history. AXP : What attracted you to working for Saudi Aramco and living in Saudi Arabia? Seal : I grew up in Pueblo Colorado. Later, in 1955, I was living in New York City, going to photography school at night and working days as a locksmith in the Times Square area. One day I saw a notice on the bulletin board saying if you were interested in traveling and doing newspaper and magazine photography, go talk to the Arabian American Oil Company, 505 Park Avenue. I went and applied for the job and got it. It was one of the best things that ever happened to me in my life. I was hired as a public relations photographer to replace Owen Oxley who had worked there for five years. There were four PR photographers when I joined the staff: Tom Walters, K. Nasar, V. K. Antony, and myself. When I left in 1960, Burnett Moody was hired to replace me. He stayed there many years and became supervisor of the photo department. Among our many responsibilities, we PR photographers took photos for different Aramco publications, like The Sun and Flare, Aramco World, the company’s annual report, some publications in Arabic, and various news releases. The engineering department had a photo section that took construction photos, passport photos, and other photos that were never used in publications. 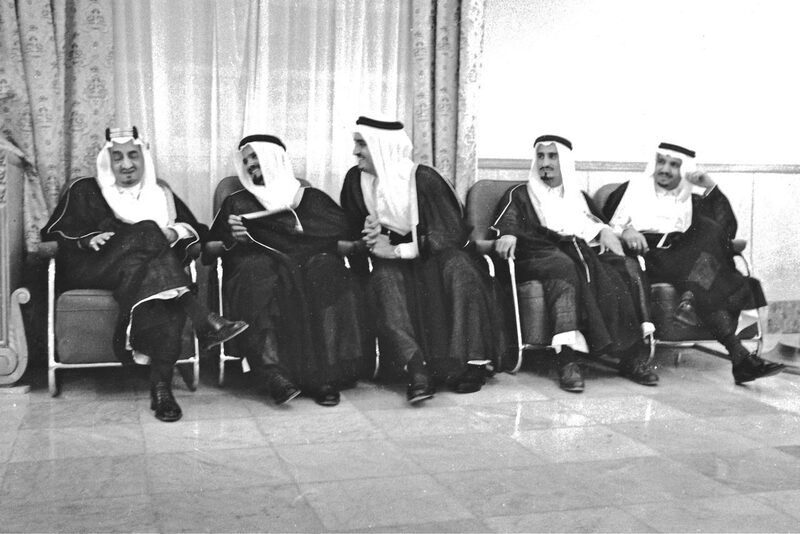 Crown Prince Faisal on left with other future Kings. Taken on a trip to the Rub' Al-Khali with a seismograph party. 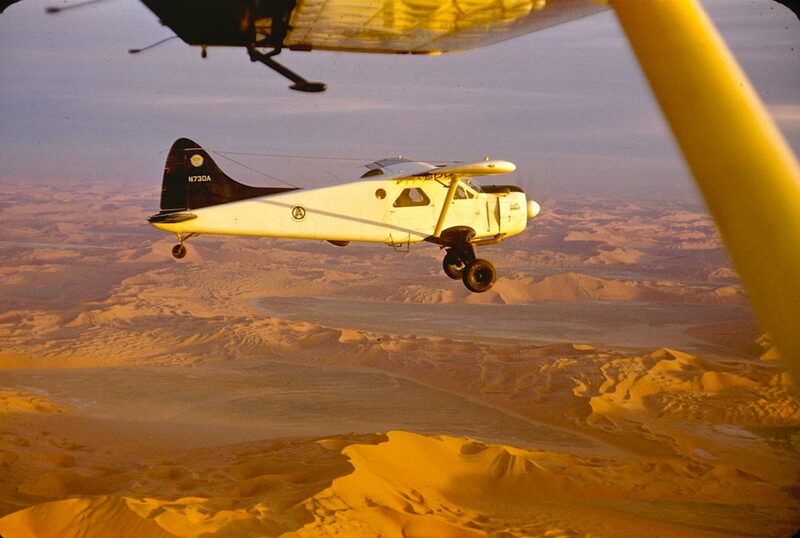 On a few trips, I flew down to the Rub' Al-Khali. Our photo assignments came in one of two categories: Oil and Non-Oil. 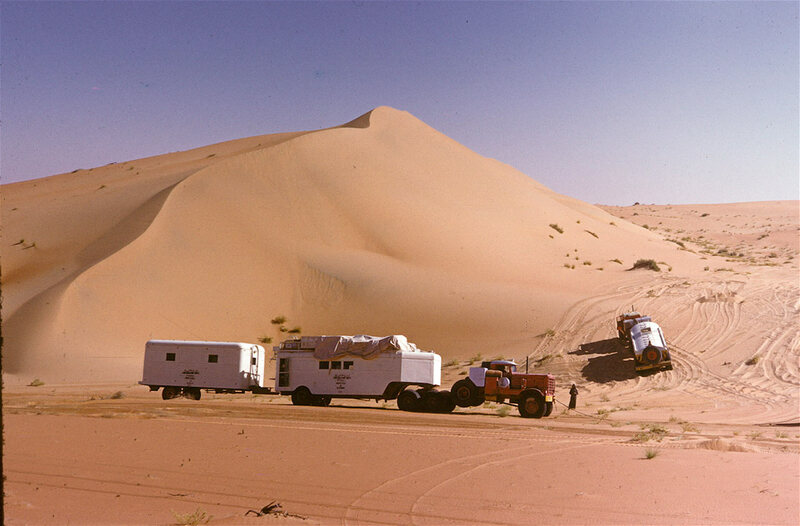 My most memorable assignment in the Oil category was a trip into the Rub’ Al-Khali with a seismograph party. In the Non-Oil category, I had a very interesting trip one time to Damascus taking photos at different factories there. On certain occasions, Aramco would loan me to King Saud. I would stay at his palace in Riyadh. There I took many photos of the royal family as well as of visitors from other countries. While staying at the king’s palace during the day, when no meetings or banquets were going on, I could walk around and take candid photos. But I didn’t take too many photos at such times. It was during meetings and banquets that I took most of my palace photos. Sheik Amin became an Aramco photographer after I left. He had been working previously for Aramco for years, only not as a photographer. 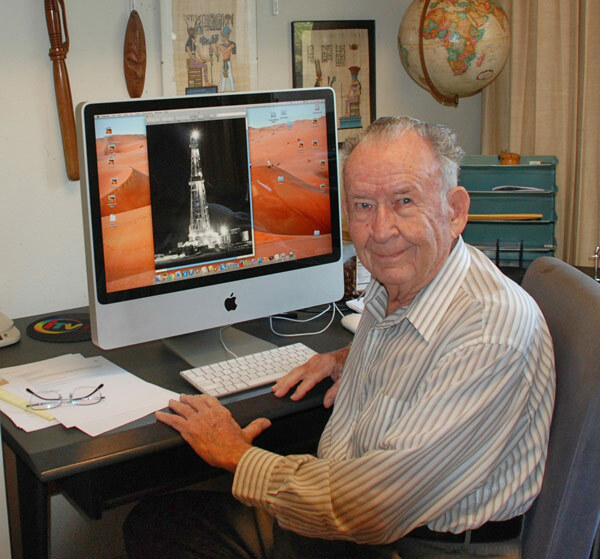 He became head photographer under Burnett Moody. I see Sheik every year. He comes to the United States to visit his sons and friends. You just ran a story and a photo by him about his visit with me. You might want to check it out: Shaikh Amin's Encounters with Aramcons: A Photo Series - Photo 8. 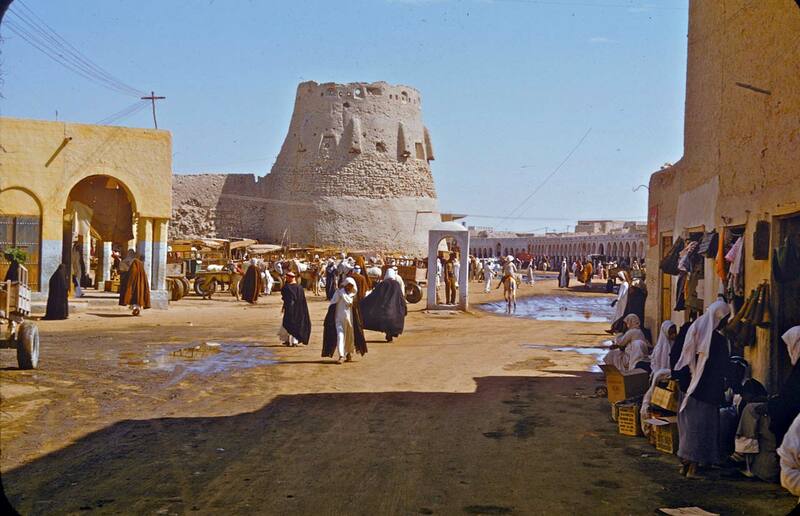 I returned to Saudi Arabia once in 1982, twenty-two years after I left. I worked there as a contract photographer for six months. It was the 50th anniversary of Aramco, and they were doing a little extra photography. I lived in Khobar at Sea View in the Aramco housing there. AXP : What is your favorite memory of your time in Saudi Arabia? Seal : I have so many good memories, it’s hard to pick just one. But yes, there is one that stands out. 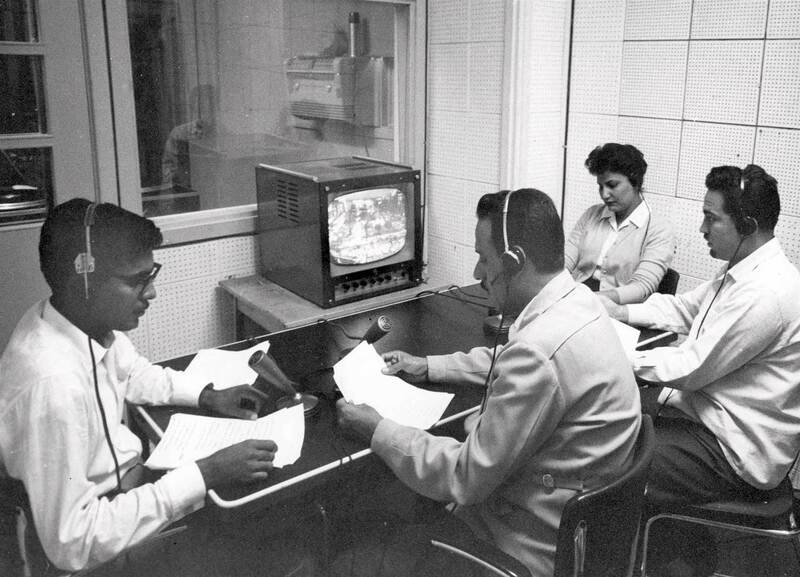 In 1955, Aramco was sending new employees to school in Sidon, Lebanon for about four weeks to learn a little Arabic. On weekends I would travel around Lebanon and Syria with other new employees. On a trip to Damascus, I took one of my all-time favorite photos. We were walking down the Street Called Straight—the street is mentioned in the Bible by that name. 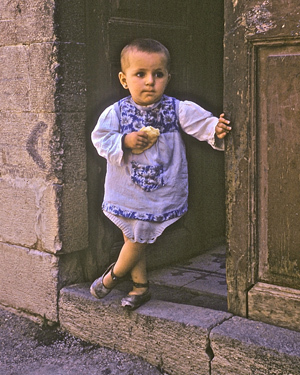 I saw a little girl standing in a doorway. I stopped, took one photo, and walked on. The main street in Hofuf. Taken at a Bedouin camp west of Abqaiq where I spent a weekend. Making an Arabic sound track for an American TV show that Aramco had bought. AXP : What are some of your favorite hobbies now? Seal : While working in Saudi Arabia and doing lots of traveling, I got bit by the Travel Bug, and there’s no known cure for that. So, my favorite hobby is traveling around the world. One of my favorite travel destinations would be Petra. I have been there three times. 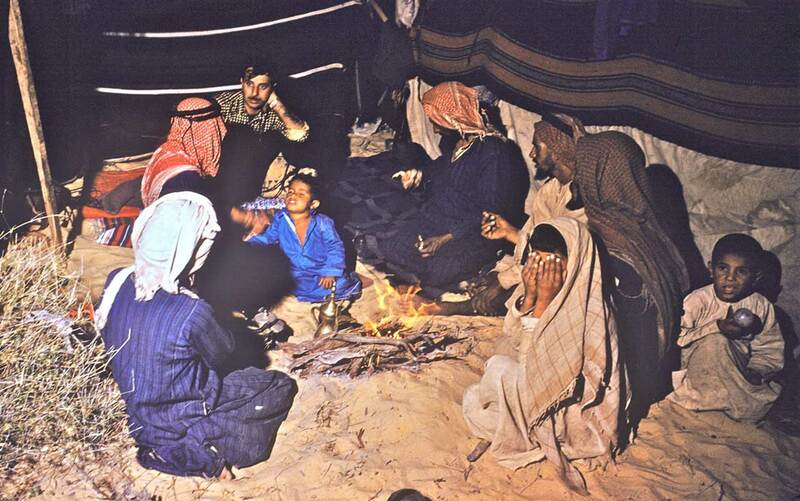 The first time was in 1958 when I went with the Dhahran Outing Group. I went again the next year with them. The next time was fifty years later with Overseas Adventure Travel. I have taken eighteen trips with Overseas Adventure Travel. I traveled with my late wife to Europe and Central America. In 2002, I went around the world by myself. I flew from San Diego to Moscow. After spending a few days there, I took the Trans-Siberian Railway to Vladivostok in the Russian Far East. I continued on from there to Seoul, South Korea and finally back home to San Diego. AXP : Where do you live today? Seal : I live in the San Diego area. After spending five years in the heat of Saudi Arabia, I found out I did not miss the snow and cold of Colorado or New York one bit. So I came to San Diego when I left Aramco. I met my wife here, and we married in 1962. We had one daughter, and she has one daughter and one son, so I’m the proud grandfather of two. My wife died in 2007. AXP : Are you planning on attending the upcoming Aramco reunion in Austin? Seal : Yes, indeed. I am planning on going to the one in Austin. I would like to see old friends and meet some new ones. Bert invites old friends to reconnect with him via email at [email protected].